padrino15 173 2.6 2.6 International Relations Male No Domestic 2011 Rejected Meh. LttleBlakDress 169 3.0 3.0 Politics and Government Female No CA 2011 Waitlisted Seriously? Applied very early Jan, waitlisted 4/12. alanrickman 167 3.8 3.8 Philosophy, Economics Male FL 2010 Applied From NOLA, got FW, why not? eagle2nole 167 2.7 2.7 Economics and History Male No FL 2011 Rejected Don't really like New Orleans, so, no worries. dvcook 164 3.6 3.7 BROADCAST JOURNALISM Female No TX 2011 Accepted withdrew, too expensive! Henricus_Rex 164 3.8 History Male No SC 2010 Accepted Heard later than all other schools, first week of April. Surprised by 25K per year despite late acceptance. mcr2011 163 3.5 3.5 Journalism Male No VA 2012 Accepted Applied 11/21. Accepted 12/5. 20K/year. TheArtfulDodger 163 3.1 3.1 History Male No LA 2011 Rejected Fee Waiver. creepa 163 3.2 3.0 Biochemistry Cellular and Molecular Biology, French, Philosophy Female No Domestic 2011 Accepted My #1 choice! Unfortunately I applied way late (March) because of my February LSAT score. jdehaan 161 3.7 History Male No CA 2015 Accepted Fee waiver. 30k/yr. Cva1992 160 3.8 3.8 English and Philosophy Male No LA 2015 Accepted 30k/year. Very happy. Sky'stheLimit 160 3.4 Accounting Male No FL 2009 Waitlisted then accepted They WLed me, and 2 days later admitted me. I think they wanted see if I was really interested by having me fill out the WL form. lukew64 159 4.0 3.3 Political science Male No TN 2011 Applied File has been "complete" for over 3 months. Still not under review. Prepare for a long wait. CassieRae 159 3.8 Political Science; Sociology Female No FL Accepted some money, gonna be a huge debt. paid deposit! vjm 158 3.7 3.4 Interdisciplinary Studies Female No VA 2007 Waitlisted then accepted Applied lateish. WL'd. Arranged visit and was accepted during my meeting with the Dean. Awesome! Gavel 158 3.6 3.3 business Male Yes International 2012 Waitlisted then accepted visited the school and sent 1 a LOCI every 4-6 weeks. - Attending! glmn01 155 3.8 3.7 Undergrad: Psychology Male No KY 2010 Rejected DUH! 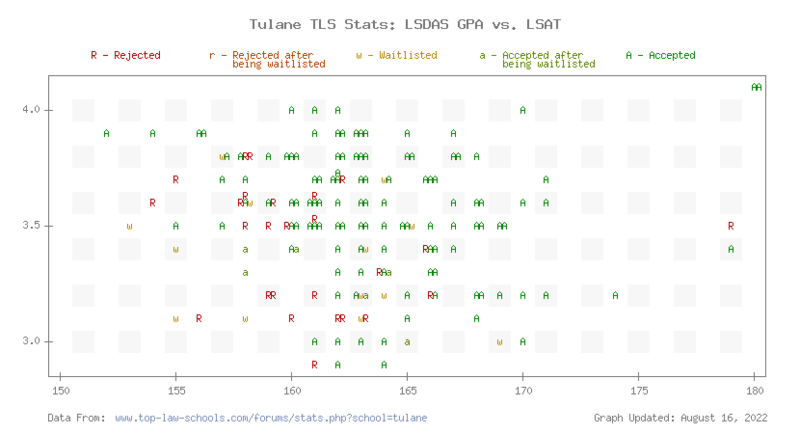 Be sure to check out the TLS Profile on Tulane Law.